I hadn't heard from many knitters about errors in my patterns, and so I have to admit I was feeling rather smug about my proofreading and tech editing abilities. 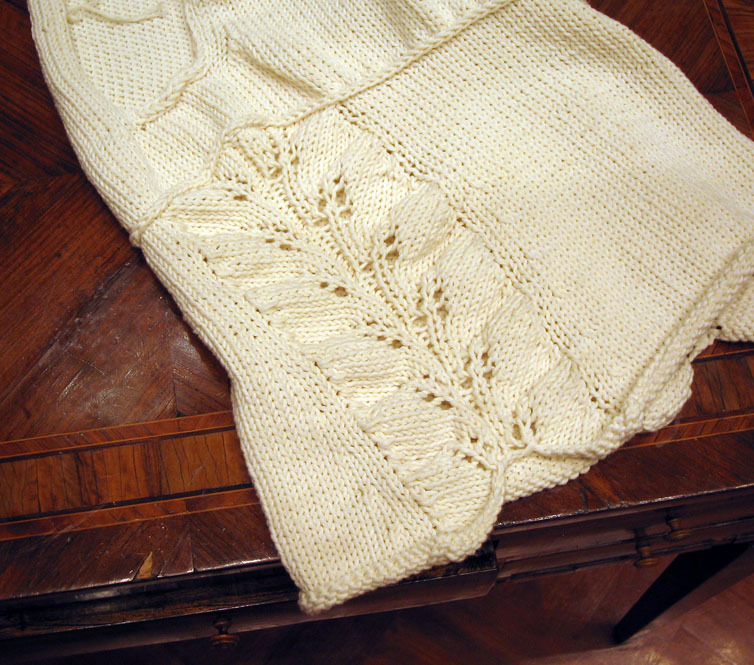 As it turns out, what probably was happening was that many knitters purchased one of my patterns, and then after some period of time-- finding the right yarn, finishing up other projects, etc.-- actually started knitting from it! Whatever the reason(s), in the last few months I've been notified of errata for the Dragon-Skin Wrap, Wyvern Wrap, Fern Fitted Shell, and now the Sorelle Pullover. Ah well. At least Interweave Knits has decided to add the Dragon-Skin Wrap to their patterns available for purchase (hope they fixed that chart before they republished it). 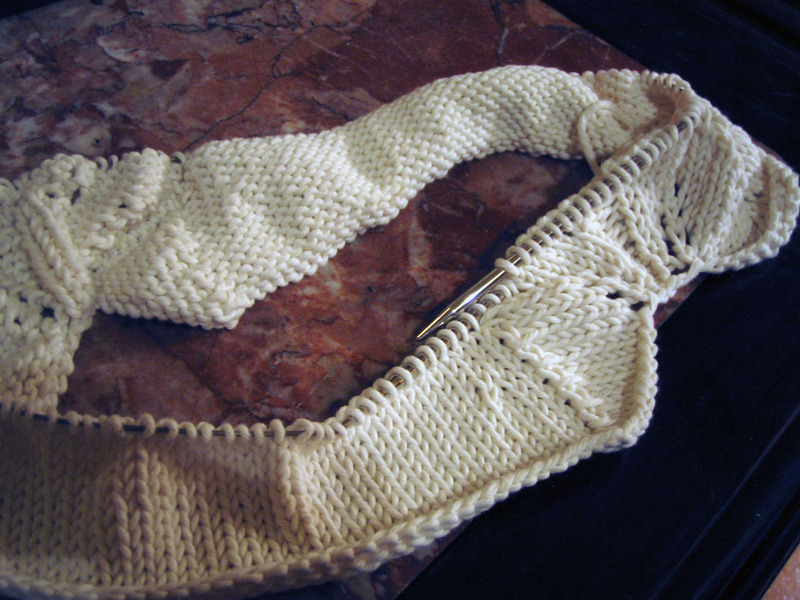 Optional short row bust shaping: the directions instruct you to work two rows to pick up all wraps, which would leave a couple of holes on either side of the shaped area. Instead, after wrapping 4 sts on each side (8 rows), work 1 rnd (you should be on the RS), picking up all wraps and knitting them tog with wrapped sts. Rep entire short row section once for D cup and twice for DD cup. Because you add a rnd for each set of short rows worked (when you pick up the wrapped sts), subtract 1 (2, 3) rnds for C (D, DD) cup from # of rnds in next section (after completion of short rows and before dividing for front and back). Patterns purchased after January 5th, 2010 include this correction as well as corrections below. Patterns after March 11th, 2008 but before 1/5/10 include only the corrections listed below. 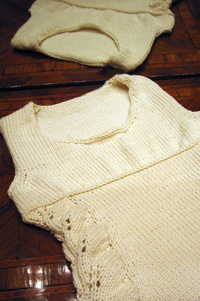 The first row of armhole shaping instructions is actually put under the heading "FRONT". The first sentence after "FRONT" should read "...k to 5 (NOT 3) sts before right side marker, ssk, SSE". 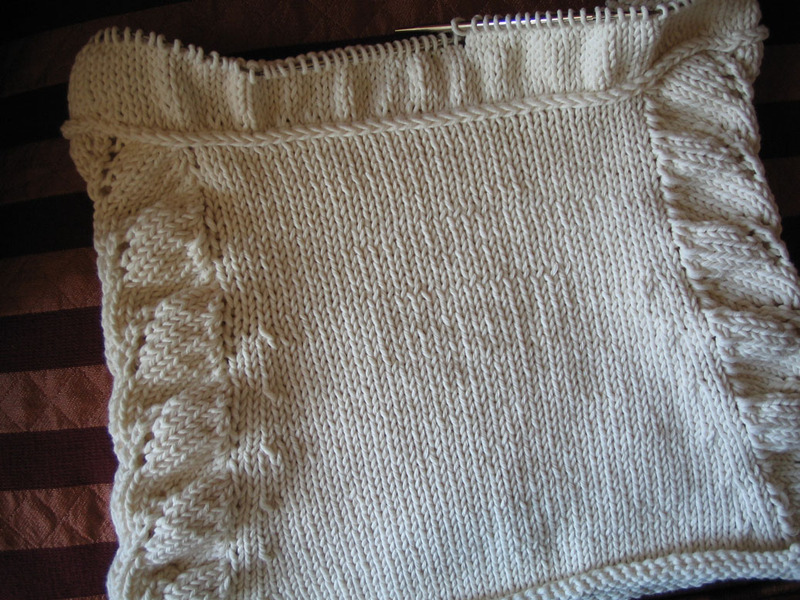 Under "Armhole shaping" (subheading of "FRONT"), the number of times to repeat the two armhole shaping rows is INCORRECT for some sizes: please substitute the following: Rep these 2 rows 0 (0, 1, 2, 3, 4, 6) times. Same paragraph: number of rows to work even after armhole shaping is incorrect for some sizes: should be 8 (10, 8, 8, 6, 6, 4) rows. 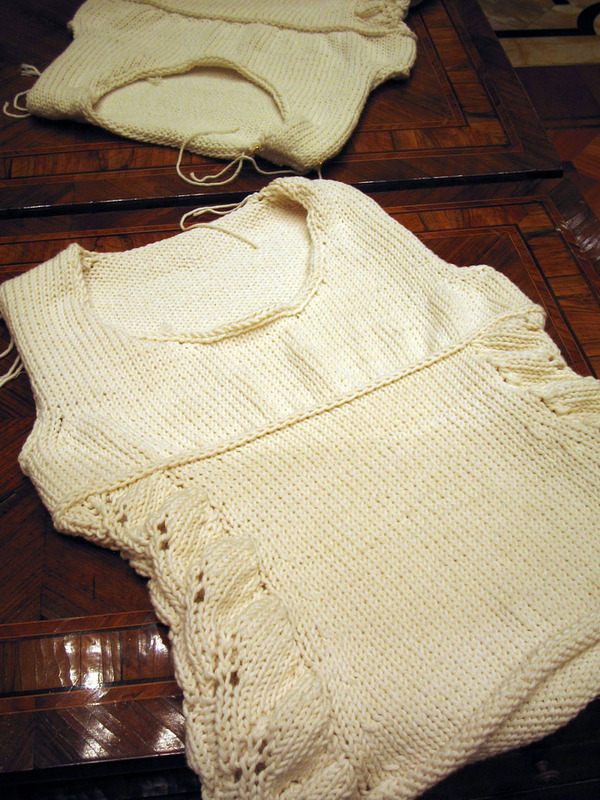 Under BACK: After joining yarn to work RS, begin armhole shaping to correspond to Front immediately; do not knit one row first. If you purchased this pattern before any or all of the above corrections were made, and would like a corrected copy, please email me at knititude@gmail.com. I think Fern turned out pretty well! Fits nicely; like the neckline; like the hemline. I wasn't sure whether I wanted to block the Fern Pattern panels flat or not, but in the end I decided I like the lace rippling a little, as it definitely wants to do. And I'm not sure that the sproinginess of this particular cotton/microfiber yarn wouldn't make heavy blocking useless, anyway. It's a good thing the upper part of a sweater front usually knits up quickly, because I've changed this one several times now. I find the neckline to be one area of a garment design that benefits from trial and error, no matter how much I might try to plan it out ahead of time. At first, I tried decreasing along the sides to add further shape to the bust area, but I didn't like the way that looked, so I tried again without the decreases--much better. Then, it's always a little tricky to determine how much higher the neckline will be once the edge is finished. I was planning to use a narrow applied I-cord edge, so I decided my first attempt was a little too revealing, and ripped back far enough to add a few rows. In the picture, the edging has already been worked, but unfortunately I'm not done yet; the edging is rolling outward at the center front and back, and now I'm going to redo it, decreasing a few stitches in both areas, which will hopefully take care of the problem. 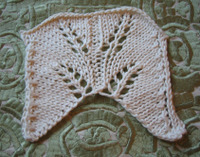 Here is a view of the side lace panel. I'm also going to add the applied I-cord edging to the hem. You can see from the neck edging that the I-cord has a softer look than the cord under the bust, not as crisply defined, but I think it looks good, and the method I used to create the cord under the bust would not have worked around the arms and neck, as it requires a level bound off edge. Here's the Fern Pattern swatch I mentioned earlier; the double decreases on each side cause a very strong curve to the stitch pattern, which is in fact why I chose to use it. I decided it would give an interesting and flattering shape to the garment: used along the sides, it will create a curved hem, front and back. Not that you can see it very well in the photo above, but hopefully the shape will become more obvious after a little more knitting. Sorry, no Italian today; la prossima volta!